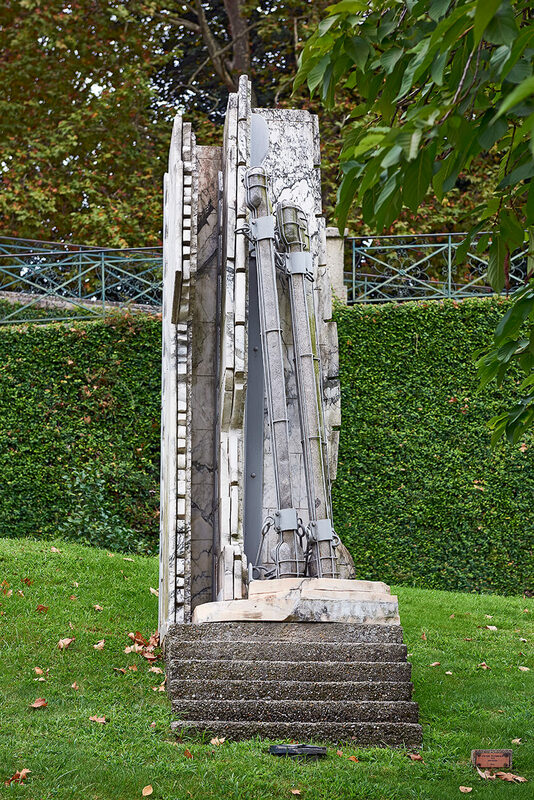 Made of marble, granite and metal, Australian Peter Rosman’s sculpture rests on a concrete pedestal featuring a miniature staircase, and shows folds, pleats and long crevices, light and dark areas, curled along the piece’s irregular verticality. Small incisions on its subtle structure allow for some metaphorical connections, especially due to the doubly wired elements inside of what looks like a gigantic “book spine”, as if it were alluding to a vast universal library, intended to stimulate the thirst for knowledge and give wings to the imagination. A complex composition, Rosman’s piece both points to a vaguely spiritual (religious?) sphere, and is imbued with humanistic feeling. Over the last decades, Peter Rosman’s multidisciplinary practice has included installations combining materials such as stone, wood and metal, as well as explored different techniques, like printing on paper, wood or steel, in order to produce artist books. Developed over time, these may be taken as autonomous objects or incorporated into new installations and sculptures.